The RETICLE-TRU Alignment Device is a versatile gadget that can function in several different methods–the Primary, Secondary, and Auxiliary Methods. When used in the Primary Method, both top and bottom indicators are indexed on the central axis of the firearm. This method is very accurate, and is very handy when the barrel is long enough to be visible. In my mind, this is a preferred way to use the device. When used in the Secondary Method, only the bottom indicator is indexed on the central axis of the firearm. This is a fast, handy way to use the tool–but in my estimation it is not always quite as reliable or as accurate. The method works very well on handguns. When used in the Auxiliary Method, the two bottoms flats–or in some cases–the two outer corner bevels, are indexed on a reference that is temporarily placed upon the firearm mounting base. The upper corner of the bevel may be needed when larger diameter oculars are used, especially if in combination with lower rings–as this causes the RETICLE-TRU Alignment Device to be displaced downward somewhat. In those situations where the ocular may be somewhat off-center from the central axis of the firearm, the Auxiliary Method is necessary, for the indicators are rendered ineffective due to the offset. 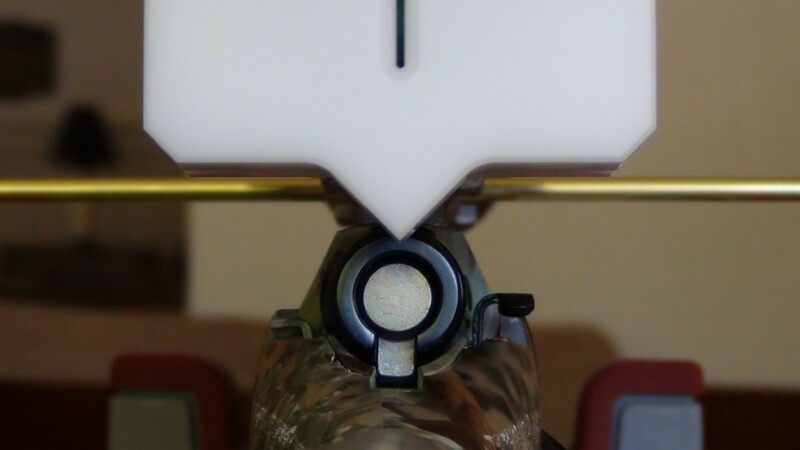 If the firearm has a suitable flat surface, the technician can rest a short straight-edge on the base, placing it so that there is contact with the rear face of the forward ring, to square the straight-edge at 90 degrees to the firearm. 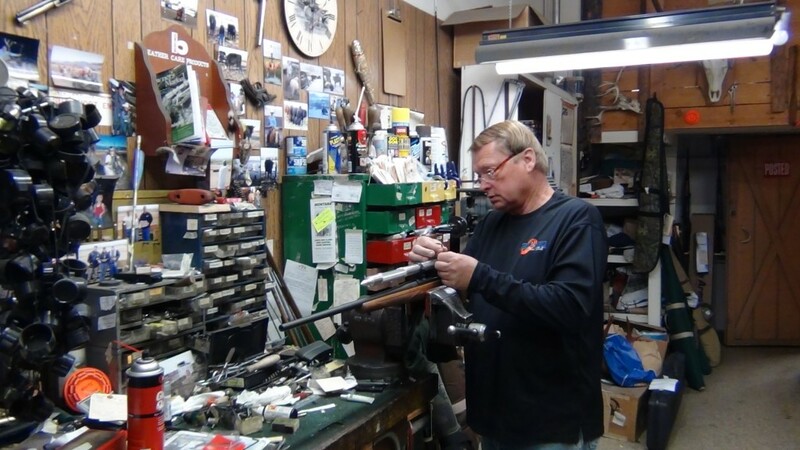 It is then a simple matter to rotate the scope and RETICLE-TRU combination within the rings so the the two bottom flats of the tool are in parallel alignment with the straight-edge. The Auxiliary Method may also be employed in those situations where the rifle has a picatinny rail–regardless of whether or not there may be off-set. This method may be necessary in those situations where a very high turret may obscure the view of the barrel–though one can in fact index off of the center of the turret. However, it must be kept in mind that the turret in some cases may not be in perfect alignment with the scope’s reticle. Therefore, it can also be a preferred way to use the device–depending upon the individual technician’s preference. To use the Auxiliary Method with a picatinny rail, simply place a short section of cleaning rod into one of the rail slots–this will orient the rod at 90 degrees to the firearm. Next, simply line up the two bottom flats so they are in parallel alignment with the rod. 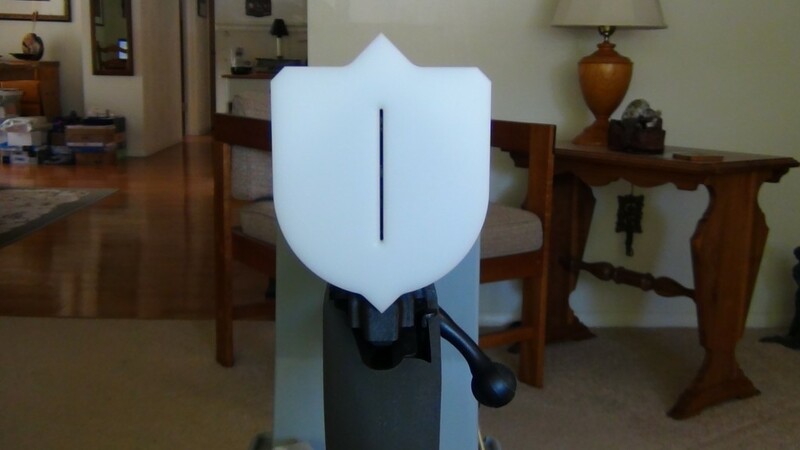 As mentioned above, if the scope has a larger diameter ocular–or low rings–the RETICLE-TRU will be displaced downward somewhat–and in this situation, the technician may then line up the left and right beveled corners so that they index parallel with the rod that is temporarily resting upon the rifle’s mounting base. 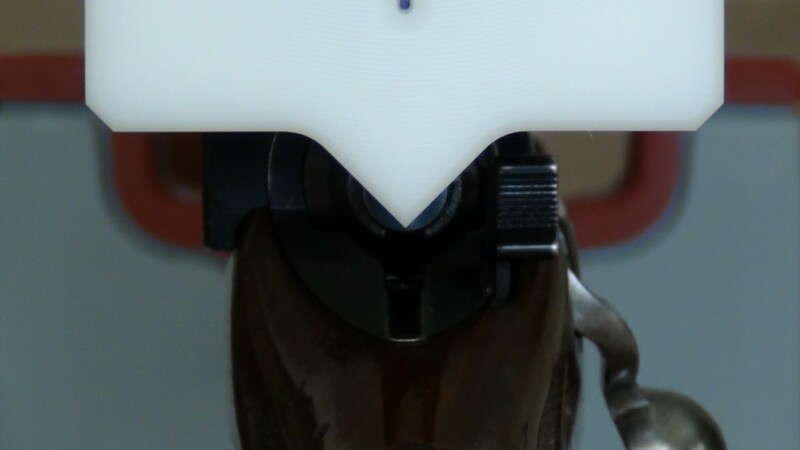 In some situations where the scope is much higher above the barrel axis, the RETICLE-TRU Alignment Device can be used in a manner that might be referred to as the Inverted Method, wherein the tool is turned around 180 degrees, so that the top indicator temporarily becomes the bottom indicator. Inverting the RETICLE-TRU can be useful in some particular installations, as this technique will allow the device to achieve about 5/8 inch more reach, which can be quite handy in some situations.